• Affects 1 in 200 children, according to the National Institute for Mental Health. • Symptoms include sudden onset of behavior akin to obsessive-compulsive disorder, anxiety, developmental regression, tics and headaches. • Appears in childhood from age 3 to puberty, developing after an infection such as strep. • Treatment varies depending on the physician. 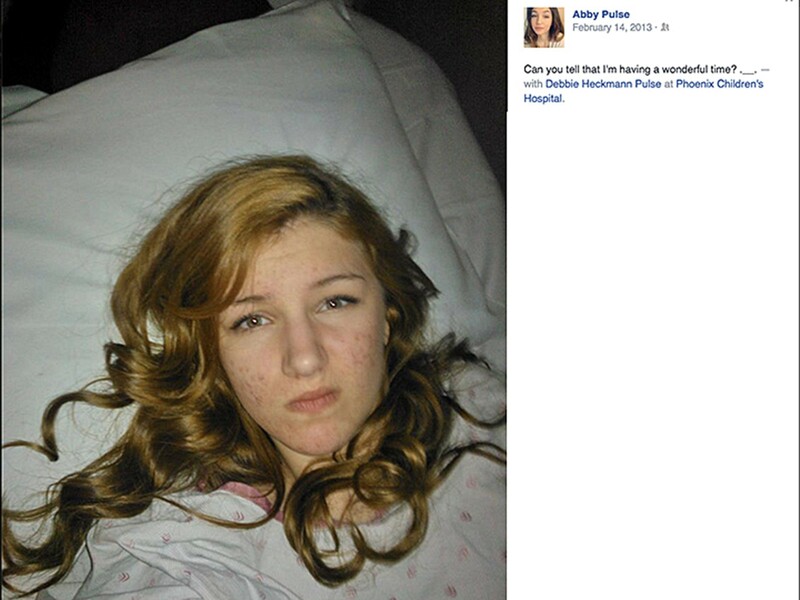 PHOENIX – Abby Pulse has been in pain every day for the past three years. At first, nobody knew what was wrong with the 15-year-old. Last year, Pulse was diagnosed with pediatric autoimmune neuropsychiatric disorders associated with streptococcal infections, or PANDAS. When the disease is triggered by a different infection, as was the case with Pulse, it is considered a subset of the disorder called pediatric acute-onset neuropsychiatric syndromes, or PANS. PANDAS/PANS are conditions related to obsessive-compulsive disorder that get worse after a child has an infection like strep, according to the National Institute of Mental Health. In Pulse’s case, it was brought on by Valley fever. The condition presents itself through symptoms including anxiety, developmental regression, significant compulsions and sensory or motor abnormalities. Pulse developed debilitating headaches and had an aversion toward odd numbers and the color orange, her mother said. But the sometimes-crippling pain this disease brings hasn’t brought the teenager down. This disease affects as many as 1 in 200 children, according to PANDASnetwork.org. Diana Pohlman, the group’s founder and director, said that awareness about this disease in the United States didn’t start until about 2007. Pohlman said that most of the research on this disease has been “sloppy” and scarce. Because if this, it is unclear whether the disease can be cured or not. Dr. Melanie Alarcio, Pulse’s neurologist, has put Pulse on a low-dose antibiotic regimen to treat her PANDAS. Pulse said that once Alarcio started her on this regimen, she went from stuttering and not being able to walk to almost normal. “Once they put me on the antibiotics, the symptoms go away pretty quickly. I’m just trying to get my body back to healthy,” Pulse said. However, the National Institute for Mental Health says on its website that antibiotics may treat the strep infection but not the PANDAS symptoms. Instead, it recommends treating with selective serotonin reuptake inhibitors, like Prozac. Alarcio, who worked at Phoenix Children’s Hospital until recently, when she chose to go into private practice, said very often children are misdiagnosed as having a behavior problem or Tourette syndrome and that doctors try to cover it up with psych medications. She called that more like a Band-Aid than a solution. “You have a diagnosis of Tourettes? Let’s see if you have an infection. When I started the kids on antibiotics, they started getting better and the tics stopped,” Alarico said. Dr. Alcy Torres, assistant professor of pediatrics and neurology at Boston Medical Center, said he believes antibiotics help but don’t solve the underlying condition. Though there is no test to check if a child has PANDAS, Torres said he treats the problem as it presents itself. He said this may include treating neurological, physical or psychological symptoms as they arise. Torres said because research on PANDAS has been difficult to perform, there are highly polarized views even about whether the disorder exists. He said he was in the middle of a study looking at PANDAS and PANS but is having a hard time finding volunteers who are afflicted. Alarcio, Pulse’s doctor, said it’s clear to her that PANDAS has something to do with antibodies crossing into the brain causing the symptoms. Alarcio said PANDAS is treatable but that there needs to be more research on whether it can be cured or not. Pohlman, with PANDASnetwork.org, said that regardless of the treatment afflicted children must receive some sort of medical care. Pulse takes 10 pills a day – down from 20 pills – to manage her disease but faces another struggle: keeping up with her peers in school. She had to miss a significant amount of school because of frequent trips to the emergency room, Phoenix Children’s Hospital, doctor’s appointments and being too drained to attend school. Her mother, Heckmann Pulse, said it’s difficult to remember what her life was like before she became a constant caregiver. Pulse said that she is able to get through the pain of the disease with the support of her family and never getting down about her situation. 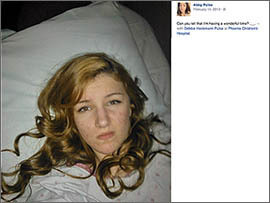 Abby Pulse, a teenager diagnosed with a form of pediatric autoimmune neuropsychiatric disorders associated with streptococcal infections, or PANDAS, shared this picture via Facebook during one hospital visit.